"the provider" means JunkPorters (UK) Ltd.
"the supplier” means where the context so permits, the provider or the providers duly authorised agent or sub-contractor. "the hirer" means the person or company requesting provision of hire item(s) by the provider. "the service" means the supply of hire item(s) by the provider, it's employees, servants, agents or sub-contractors for the period of hire to facilitate the removal of refuse on behalf of the hirer and the subsequent disposal of the contents of such hire item(s) or hire item(s)s on behalf of the hirer. "the hire item(s)" means any hire item(s) or any other hire item provided as part of the service. "the site" means the place where the hire item(s) is deposited at the request or direction of the hirer. "the period of hire" means the period from delivery of the hire item(s) to the hirer, to collection thereof, from the hirer or such time as collection thereof ought reasonably to have been completed by the supplier. "Working day" shall mean Monday to Saturday in any week. "Force Majeure" means any circumstances beyond the reasonable control of either the provider or the supplier (including, without limitation, thereto, any strike, lock out or other form of industrial action, accident, inclement weather, difficulties in obtaining fuel parts or machinery, power failure or breakdown, or malfunction of machinery or computers. In consideration of the provider extending credit to the hirer as named, the person signing this form herby guarantees payment to the provider of all outstanding monies including amounts owed in excess of credit limit and any interest applicable. 1. These conditions shall apply to all contracts for the supply of the service by the provider to the exclusion of all other terms and conditions and shall apply where the context so permits for the benefit of the supplier and the employees, agents and sub-contractors of the provider and the supplier as if they had been parties hereto. 2. The provider reserves the right to add to, alter or amend or withdrawal any of these terms or conditions without notice. Any typographical, clerical or other error, or commission in any sales literature, quotation or price list, acceptance of offer, invoice or other document or information issued by the provider shall be subject to correction without any liability on the part of the provider. 3. Any reference in these conditions to a statute or regulation or provision thereof shall be constructed as a reference to that statute, regulation or provision as a amended re-enacted or extended at the relevant time. 4. All requests for the service shall be deemed to be an offer by the hirer to purchase the service pursuant to these conditions and the service is offered subject to the availability of suitable hire item(s) to the provider. The Hirer agrees that they will rely wholly on their own hire item(s) and judgment in the selection of the service and will not treat any information supplied to them by the Provider as a representation, warranty or guarantee in any manner whatsoever. 5. No variation of these conditions shall be binding unless agreed in writing between the authorised representatives of the Provider and the Hirer. 6. The Provider will use its best endeavours to comply with the Hirer's requirements but can accept no responsibility for failure to supply, or remove or for any delay in supplying or removing hire item(s) which may be caused directly or indirectly by any circumstances beyond the Providers control, or any unforeseen or abnormal conditions by any act or neglect on the part of the Hirer and time shall not be of the essence of the Contract save as to payment by the hirer for the service. The provision of the service may be wholly or partly suspended at the providers discretion without liability on the part of the provider for any loss resulting from any suspensions. 7.a) Except as specifically otherwise agreed in writing the provider or supplier, shall be under no obligation to deposit the hire item(s) elsewhere than on a highway. to rely on their own skill and judgment and to satisfy themselves as to the suitability of all approach roads, tracks, or grounds, for the purposes of delivery, siting and collection of hire item(s) and to notify the provider at the time of ordering the service of any special requirements as to delivery. promptly on the arrival of a JunkPorters vehicle to accept delivery and provide any necessary directions and a suitable site. 7.c) The Hirer shall save harmless and keep the provider indemnified against any claim demand or penalty arising during the period of hire and which could not have been made had the provider not agreed to provide the service including, but not limited thereto all 3rd party claims, or claims for damages arising out of accidents related to any hire item(s) the subject of this contract. 8.i) The price for the provision of the service shall be such sum as shall from time to time be agreed between the parties & in default of agreement shall be a quantum merit otherwise agreed shall be exclusive of VAT which shall be payable by the Hirer. 8.ii) Save where the Hirer has a previously approved credit account with the Provider payment for the provision of the Service shall be made in full by the Hirer to the Provider prior to the delivery by the Provider of any junk removed. 8.iii) Where the Hirer has an approved credit account the provider shall be entitled to invoice the Hirer at the end of the month for all the services provided hereunder prior thereto and the Hirer shall pay the price for the provision of the service to the Provider within 30 days of the date of the Providers invoice. The time of payment of the price shall be of the essence of the Contract. 8.iv) The Hirer agrees that in the event that the Hirer shall fail to pay the Provider's account in accordance with the terms here of the provider may return to the Hirer the waste or a quantity of waste which is in the reasonable opinion of Provider similar thereto and the Provider shall for such purposes be entitled to enter upon any premises of the Hirer or any third party from whom waste was collected for such purposes and to deposit such waste thereon. 8.v) The provider reserves the right to grant, refuse, withdraw, restrict, alter or cancel credit terms at its discretion. Where the Service is to be supplied over a period of time each instalment thereof shall be treated as a separate contract and failure by the Provider to provide any one or more instalments, shall not entitle the Hirer to treat the contract as a whole as repudiated. 8.vi) If the Hirer fails to make any payment on the due date then, without prejudice to any other right or remedy available to the seller, the seller shall be entitled to :a) cancel the contract or suspend any further deliveries to the Hirer. 8.c) Charge the Hirer interest (both before and after any judgment) on the amount unpaid, at the rate of 9.5% above base rate per month until payment in full is received. 8.d) Charge the hirer’s credit card as listed on the credit card and bank reference form to bring the account back into agreed trading terms. 9. The Hirer shall where so required to do by the Driver direct the Driver where to deposit or pick up the hire item(s). 10.a) Where the provider or the Driver are requested or directed to park or pick up hire item(s) on or from a site which is off a highway or where delivery otherwise involves the passage of the vehicle over gratings, drains, roads, pavements, forecourts, yards, asphalt areas or any like areas the Provider shall be under no liability whatsoever to the Hirer for any damage howsoever caused whilst the vehicle is off the highway other than as shall be caused by negligent driving on the part of the driver. Without prejudice to the generality of Condition 7c) the Hirer shall subject as above save harmless and keep the Provider indemnified against any claim or demand which could not have been made had the Driver not been so requested or directed. The Hirer will in addition compensate the Provider for any damage to the vehicle or the hire item(s) which would not have occurred had the Driver not been so requested or directed and which is not due to any negligence on the part of the Driver. 10.b) If the Provider shall be prevented for any reason beyond its control from delivering or collecting a hire item(s), the Hirer shall remain liable for the Provider's charges together with such additional sums as the Provider shall reasonably so require for the further provision of the Service. 11. The time allowed for depositing or picking up hire item(s) is ten minutes. If the vehicle is kept waiting longer than this after arrival the Hirer shall be liable for reasonable demurrage. Standing times are chargeable at £65.00 per hour or part thereof. 12. The standard time allowed for a ‘Wait & Load’ is fifteen minutes. If the vehicle is kept waiting longer than this initial time, the hirer shall be liable for a waiting charge of £65.00 per hour or part thereof. 13. The Hirer shall ensure that all permissions required before the hire item(s) can lawfully be deposited on the site including the permission required under the Highways Act 1971 have been or will be obtained before they request the Provider or direct the Driver to deposit the hire item(s) on the site and that the said permission will be kept in force during the period of hire and where necessary for up to 1 working days thereafter. 14. The Hirer shall not move the hire item(s) from the site without the consent of the Supplier and where necessary the highway authority. a) That the Hirer signs a single or multiple transfer note declaring the waste type and that the waste is accurately described when completing the transfer note. b) Where the waste type does not conform to the description as specified on the waste transfer note or is different to that as specified at the time the hire item(s) was ordered, then charges will vary accordingly. 16. It is specifically provided and agreed that any compensation &/or damages payment in respect of any claim or claims arising out of or in connection with the terms of this contract for any reason whatsoever and howsoever arising shall not amount in the aggregate to more than the cost of the provision of the service by the provider or that part of the Service giving rise to such claim and Provider and any other person entitled to the benefit of this contact shall have no further liability to the Hirer. Except in respect of death or personal injury cause by the negligence of the provider or any other person entitled to the benefit of this contract, the Provider or such party shall not be liable to the Hirer by reason of any representation, or any implied warranty, condition or other term, or any duty at common law, or under the expressed terms of this contract, for any consequential loss or damage (whether for loss of profit or otherwise), costs, expenses or other claims for consequential compensation whatsoever (and whether caused by the negligence of the Provider or any other party entitled to the benefit of this contract, there employees, or agents, or otherwise) which arise out of or in connection with the supply of the service, except as expressly provided in these conditions. 17. The Provider shall not be liable to the Hirer or be deemed to be in breach of the contract by reason of any delay in performing, or any failure to perform, any of the providers or suppliers obligations in relation to the service, if the delay or failure was due to force majeure. 18.1) Application for refunds must be sent directly to JunkPorters (UK) Ltd, in writing, addressed to the Customer Service. Please note as a company we do not offer cash refunds, we can however apply a credit note, once authorised, to use against future purchases. Cancellations 24hrs before JunkPorters teams Arrival. 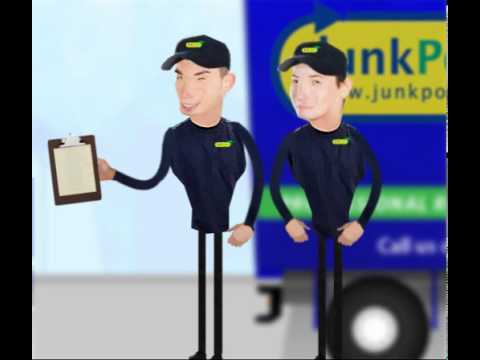 In all cases delivery and collection times are given for guidance only and JunkPorters accepts no liability for any costs incurred due to delays in delivery/collection or failure to deliver on the preferred delivery date due to unforeseen circumstances. In all circumstances invoices exclude exceptional conditions such as force majeure'. 3.1 The amount of any Deposit, Rental and/or charges for any Services shall be as quoted to the Customer or otherwise as shown in the Supplier's current price list from time to time. Where a Deposit is required for the Hire Goods it must be paid in advance of the Customer hiring the Hire Goods. The Supplier may also require an initial payment on account of the Rental in advance of the Customer hiring the Hire Goods. 3.4 *If the Customer fails to make any payment in full on the due date the Supplier may charge the Customer interest (both before and after judgement) on the amount unpaid at the rate of 9.5% above the base rate from time to time of the Supplier's bank. Such interest shall be compounded with quarterly rests. 4.4 The Customer must not deal with the ownership or any interest in the Hire Goods. 4.5 The Supplier may provide reasonably priced insurance in respect of the Hire Goods at additional cost to the Rental. Alternatively the Supplier may require the Customer to insure the Hire Goods on such reasonable terms and for such reasonable risks as the Supplier may specify. The proceeds of any such insurance shall be held by the Customer in trust for the Supplier and be paid to the Supplier on demand. The Customer must not compromise any claim in respect of the Hire Goods and/or any associated insurance without the Supplier's written consent. 5.2 Where the Supplier provides Services the persons performing the Services are servants of the Customer and once the Customer instructs such person they are under the direction and control of the Customer. The Customer shall be solely responsible for any instruction, guidance and/or advice given by the Customer to any such person and for any damage which occurs as a result of such persons following the Customer's instructions, guidance and/or advice except to the extent that the persons performing the Services are negligent. 5.3 If any Services are delayed, postponed and/or are cancelled due to the Customer failing to comply with its obligations the Customer will be liable to pay the Supplier's additional standard charges from time to time for such delay, postponement and/or cancellation except where the Customer is acting as a consumer and the delay is due to a Force Majeure event.